"Is there any chance that I can use VLC Media Player on Mac to play iTunes downloaded movies and TV shows? I was used to playing the videos via VLC, but it refused to play the iTunes videos when I tried to directly play the videos from iTunes library." 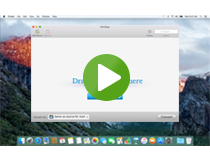 As is known to us that QuickTime Player is the default video player on Mac OS. However, some video formats are not supported by QuickTime. VLC is considered as one of the best media players on Mac that support nearly all of the video formats for playing back. However, if you are going to play M4V with VLC Media Player, you will get disappointed. Because the M4V movies and TV shows bought from iTunes Store are protected by Apple's FairPlay, and they can't be played on non-Apple devices or video players. You have to turn to iTunes to play the iTunes downloaded video files. But if you prefer to play them with VLC, you need to remove DRM from iTunes M4V videos first. 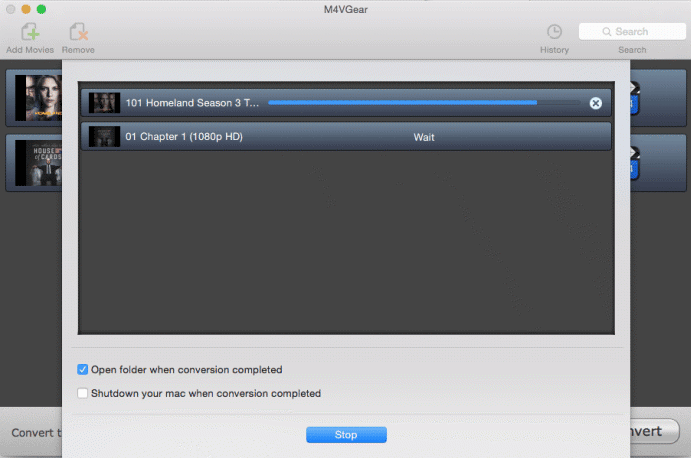 Here M4VGear DRM removal software is recommended as the best program on Mac to convert iTunes M4V for playback with VLC. It directly remove DRM protection from iTunes purchased and rented video files and remux to MP4 format with original quality. What's more, adopting an innovative DRM decrypting technique, M4VGear can strip off DRM from your iTunes movie, TV Shows, Music Videos at 20X faster speed, which makes it to be the fastest DRM remover in the world. 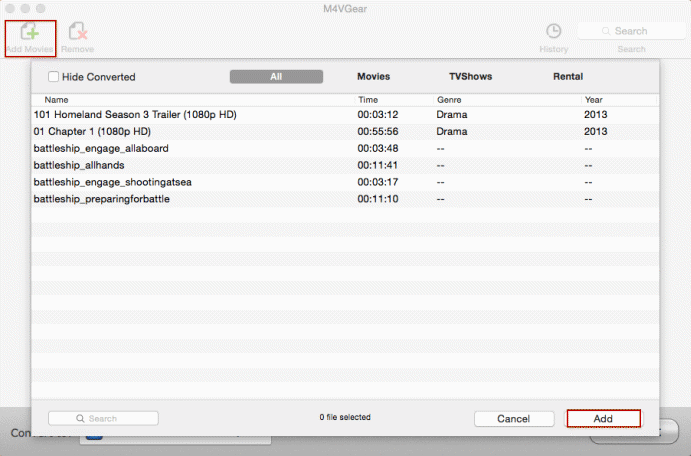 After downloading, install and launch the M4VGear iTunes Media Converter on Mac, click Add button to import the M4V videos you want to convert. Please make sure that the video can be smoothly played on iTunes before converting. Otherwise, the conversion will fail. Click the button "Convert Now" to start conversion from iTunes M4V to VLC supported MP4 videos on Mac. This iTunes M4V to VLC video converter will remove the DRM and remux the video in MP4 format with all the audio tracks kept. Thus, you can choose the language you want to play the converted video with. After conversion finished, you can directly open the output folder and play the converted MP4 video with VLC Media Player. If the original video contains the subtitles or closed caption, they can also be kept in the converted video. You can select the subtitles from the playing preference of VLC. 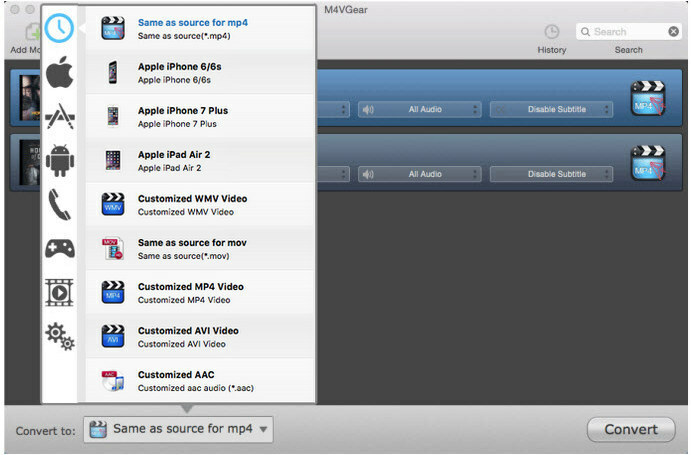 Tips: M4VGear will offer you a 1 minute free trial which will let you convert one minute of iTunes rentals for free. If you want to unlock the time limitation, please purchase M4VGear. The price now is $44.95, decreasing from original $49.95 by $5.